PCI Express has been adopted as a mainstream interface of storage, which dramatically increases data transfer bandwidth and application performance. 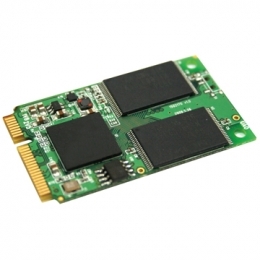 InnoDisk PCIeDOM is a revolutionary innovation of disk on module with PCI Express interface, which brings you new generation of storage solution, especially for embedded system and server application. Comparing with most PCIe devices in the market, PCIeDOM comes with unique design, as well as patented mechanism, which provides a tiny but solid storage device. Besides, it also has Mini PCIe form factor, which can be applied in most embedded system through Mini PCIe interface, without any system and circuit modification. Within high bandwidth of PCI Express, and excellent performance of PCIeDOM, it can reduce boot up time and provide both sustained and random data transfer performance. Why buy this from MemoryDepot.com? Flash memory can be erased a limited number of times. This number is called the erase cycle limit or write endurance limit and is defined by the flash array vendor. The erase cycle limit applies to each individual erase block in the flash device.Mini PCIeDOM uses a wear-leveling algorithm to ensure that consecutive writes of a specific sector are not written physically to the same page in the flash. This spreads flash media usage evenly across all pages, thereby maximizing flash lifetime.